Ultrasonography in Ophthalmology 14 presents a selection of the papers presented at the 14th SIDUO Congress, Tokyo, Japan, 1992. 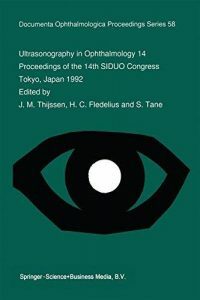 The papers have been grouped into the following subjects: instrumentation and techniques, biometric ultrasound, diagnosis of intraocular disease, and diagnosis of orbital and periorbital disease. Audience: All those involved in ophthalmic ultrasonography.